Friday February 17th, 2012, time 6,30 p.m. at MACRO Museum, via Nizza 138, in Rome. I HAVE SEEN THE FUTURE will be the fourth cool event that the creative Roman group of CityVision will presents at the MACRO museum of via Nizza in Rome next February 17th 2012 – 6,30 pm. 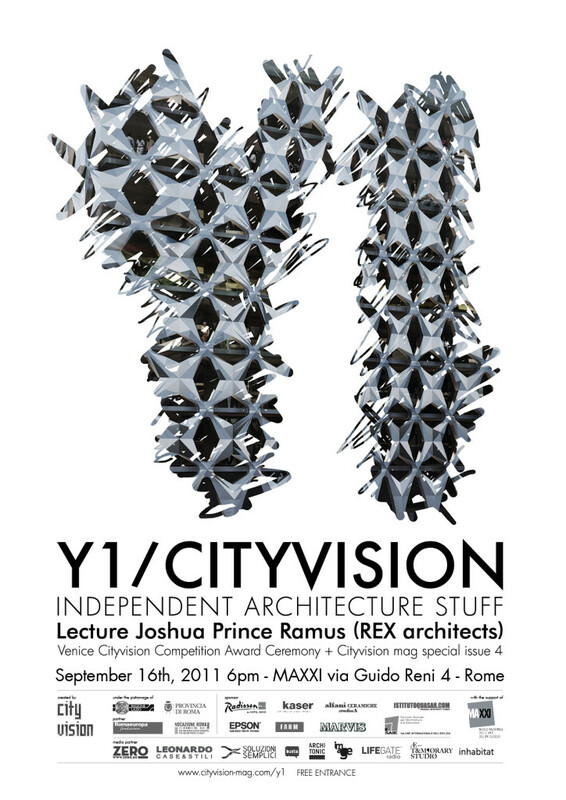 After the great success of Rome CityVision Experience, Love and Kill your own Town and Y1 Independent Architecture Stuff, a new independent architecture event will host, for the first time in Rome, the famous London office SQUINT/OPERA with a lecture of Jules Coke (Squint/Opera founding director). It will be announced a new international architecture competition to explore the future of the Big Apple: New York CityVision Competition. The jury panel will be composed by Joshua Prince-Ramus (REX Architects), Eva Franch i Gilabert (Storefront for Art & Architecture), Roland Snooks (Kokkugia), Shohei Shigematsu (OMA ny), Alessandro Orsini (Architensions) and Mitchell Joachim (Terreform One). During the event the new issue #5 of CityVision Magazine will be presented and freely distributed as also winners and shortlisted of PFFF – Inflatable Architecture Competition organized by CityVision and FARM, will be revealed. London based office for movies, post-production and new media focused on architecture. More than 30 experts including graphic designer, 3D animators, web designers, musicians and filmmakers (mostly with an architecture related background) working on both national and international projects asl also on small and large scale. Squint/Opera is currently working on projects in Singapore, United Arab Emirates, England, Turkey, USA and China. The company is headquarted in London, Melbourne, Abu Dhabi and Istanbul. Among their clients are Foster and partners, Grimshaw, Skidmore, Owens and Merrill and many more. CityVision is an architecture laboratory with the aim of generating a dialogue between the contemporary city and its future image. It’s a way to explore the reality and the future of architectural design thanks to an editorial project, CityVision magazine; the organization of international architecture competition, CityVision competition; events and lectures, CityVision events. CityVision is a place to invent, experiment and generate new ideas, a space in continuous evolution, as the urban environment itself. 2012 kicks off by MACRO (Museum of Contemporary Art of Rome) taking a new course under the direction of Bartolomeo Pietromarchi. Based on a wide and various exhibition program, following an innovative concept, the museum represents a main center for artistic production and research on contemporary arts. The aim was born by the need to review the artist’s role as a main actor of the museum’s activities. The revitalization and enhancement of each new spaces of the MACRO are the cornerstones of this course. This is true not only for the exhibition spaces, but also and especially for those spaces whose function and vitality are expressed through the public’s presence. It is to the public itself that Odile Decq’s 2010 architectural intervention (awarded the Golden Lion at the Venice Architecture Biennale in 1996), above the Peroni factory, is addressed, being situated in a privileged location. As well as this location the MACRO Testaccio space was also completed, located in the same Roman district.